Have you found a Connecticut quarter and want to know what it’s worth? Believe it or not, many 1999 Connecticut state quarters are worth far more than their 25-cent face value. Some 1999 State Quarters are even worth hundreds or thousands of dollars — no joke! So… which Connecticut quarters are worth the big bucks? And which ones are worth just 25 cents? What’s The Most Valuable 1999 Connecticut Quarter Error? There’s one type of Connecticut quarter error worth as much as $10,000! Apparently, a few of the 50 State Quarters from 1999 were struck on the planchets (coin blanks) designed for the Sacagawea dollar. These “experimental quarters” are quite rare — only a few were made representing each state (Delaware, Pennsylvania, New Jersey, Georgia, Connecticut) from the first year of the 50 State Quarters series. These are super rare and super valuable experimental planchet errors! So… how can you tell if you’ve got a rare Connecticut quarter error struck on a Sacagawea dollar planchet or an ordinary quarter with gold toning? Weight — This Connecticut error quarter registers between 5.9 and 6.3 grams in weight — much heavier than the normal 5.67-gram weight for a regular copper-nickel clad Connecticut state quarter. Thickness — Does your quarter look thicker than normal? A 1999 error quarter does. Color — The Connecticut error coin will appear gold, or even greenish in color. Edge — The 1999 Connecticut quarter error doesn’t contain any edge reeding (those vertical lines on the edge of a normal quarter) — this quarter has a smooth edge. If any of your 1999 Connecticut state quarters seem to match the characteristics listed above, then it’s worth having it checked out by a numismatic professional. You can take your coin to a reputable coin dealer or have it certified by a third-party coin-grading company. Have you had a hard time finding any 1999 Connecticut state quarters struck on wrong-metal planchets? No worries!… There are many other kinds of errors to look for on your Connecticut state quarters. At this point, there aren’t too many doubled dies for the Connecticut state quarter known to exist — but there’s at least one out there! It involves doubling in the branches of the Charter Oak on the reverse (tails side) of Philadelphia-minted coins. Values range all over the board, but pieces like this commonly trade for around $10 or $20 apiece. These are really cool errors that show the coin struck partially off-center. The more off center the strike, the more this Connecticut quarter error is worth. A Connecticut state quarter that is minimally off-center, say by 5% or 10%, may trade for $15 to $50. But if you find a drastically off-center specimen with more than half of the design missing and the date still showing… a piece like that can bring hundreds of dollars! Some coins have unintended, raised blobs of metal on the surface. These are caused by areas of damage to the die (the device that strikes an image onto a blank coin) and are known as die chips, die breaks, and die cuds. Connecticut state quarters with die chips (or tiny die breaks) can range in value from $3 to $10 apiece — sometimes more. Find a die break that appears as a long line running across the surface of the coin? These errors can bring more than $100. And a 1999 Connecticut state quarter with a large die cud can inspire intense bidding among error coin specialists and go into the hundreds of dollars! How Much Is A Regular 1999 Connecticut Quarter Without Errors Worth? 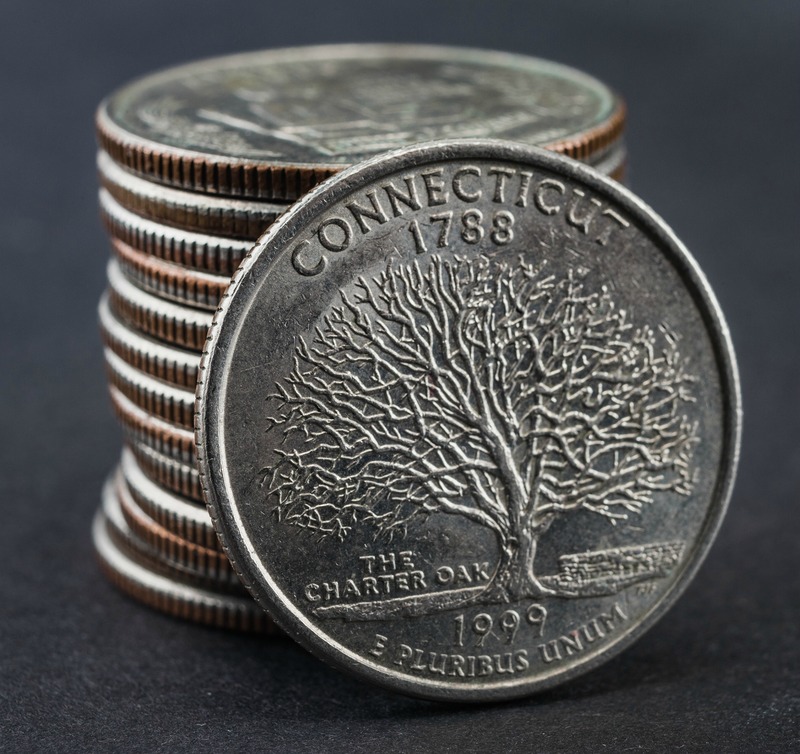 We all want to find rare and valuable errors in our pocket change, but most likely you’ll wind up finding a bunch of Connecticut state quarters without errors. So, are they worth only face value? For the most part, yes. A regular 1999 Connecticut state quarter from the Philadelphia Mint (P mintmark) or Denver Mint (D mintmark) that is worn and has no errors is worth only its face value of 25 cents. How Many 1999 Connecticut Quarters Were Made? In a nutshell? LOTS! More than 1 billion were struck. But you came here looking for a more precise mintage figure, didn’t you? So… 1999 Connecticut state quarters aren’t rare coins. But if you find a super-nice one, or one with an error, you may have hit the jackpot! John Flanagan designed the portrait of George Washington depicted on the obverse (heads side) of the Washington quarter beginning in 1932. Sculptor-engraver William Cousins modified the Washington bust design in 1999 to help make more space on the coin for the various designs in the 50 State Quarter series. T. James Ferrell designed the motif featuring the Charter Oak — a large tree that dated to perhaps the 12th century and sadly fell during a storm in 1856. Legend says Connecticut’s Royal Charter of 1662 was tucked away inside the hollow of the tree to hide it from the English governor-general. Over the centuries, the tree became symbolic of American independence. In addition to its appearance on the 1999 Connecticut state quarter, the Charter Oak is also found on the 1935 Connecticut Tercentennial half dollar. Connecticut was the 5th state to join the Union. It ratified the U.S. Constitution on January 9, 1788. Connecticut’s nickname, “The Constitution State,” is derived from the first constitution of Connecticut — drafted 1638-39 and known as “The Fundamental Orders.” Many say “The Fundamental Orders” inspired the drafting of the Constitution of the United States in the 1780s.